SuperFiles is a universal sending application that is designed to send your pictures and text files on your iPhone, iPod touch, and iPad, and send them to Google Docs, Picasa, Flickr, FTP, iDisk, and email. This app costs $3.99 and is created by ArlexSoft. To start this up, let’s just point out some of the uses of this app. The SuperFiles app can turn files off your iDevice into MS Word, Powerpoint, Rich Text, html, Jpeg, bmp, gif, tif, txt, move, mp3, CSV, zips, multi-page PNGs, and a hail of different other formats. SuperFiles can also log in to your cloud file storage locations like Google Docs, Dropbox, iDisk and Flickr, Picasa, WebDav and FTP accounts for importing and exporting files to and from. There are some mixed reviews of this app in the AppStore. There are comments about how it’s difficult to navigate and convoluted or overwhelming in the AppStore. Because of this, I will explain in detail! Let’s begin with image sending. First, start up the app. On the start page, you’ll see “Album” with Photo Library under it. Touch that. Next up, you’ll find a back button followed by a “Take Photo button” and an “Import from Photo Library.” Take Photo will activate the camera and Import will open your own picture library. From there, select or take your image. You’ll be greeted with an “OCR button” and a “Take Next Photo” button. OCR will bring you to a photo editing program to edit the image while Take Next Photo will allow you to redo your shot. After you are done it will be added to the “Files” section of the first page of this app. Touch that image and you’ll get 19 options. These options are clearly labeled processes. So, in summary: “Take an image, select it, use it.” When you read comments in the AppStore, sometimes, you just gotta wonder. At the bottom of the first page in the app, you’ll see a little thunder button. Once you touch the button, you’ll find the “New Text File” button that will allow you to make your own notes and send them or make a copy from your default Notes app and paste it into the “New from Pasteboard” button. Besides document sending, SuperFiles also includes a speech function that will read your text files in English, French, German, Italian, and Spanish, perfect for those of us with less than perfect eye sight or for those of us who need someone to read instructions while we are busy cooking or driving. 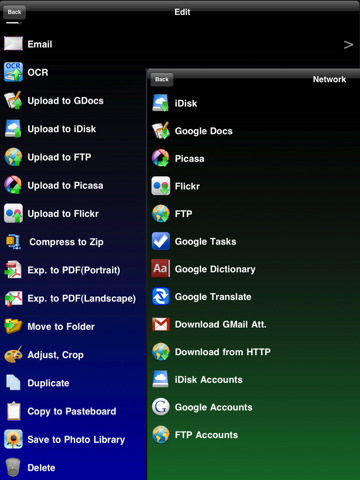 There is a full text translator that covers 52 languages, a music/movie player, and an online file sync system to keep those documents updated on all your iDevices and computer. This app could really use a brief tutorial explaining it’s buttons. There are so many functions, processes, translations, updating, and conversions that could be done in this app, a full tutorial that the user could easily refer to could make users feel more welcome into SuperFile’s many strengths. It would also be extremely useful to have images show a thumbnail of that image rather than the stock image it uses. All images look the same and the visual is confusing since it sort of implies that whatever image you chose became a different one. This is a minor visual issue. SuperFiles is simple to use with more than a dozen options and online storage support. It is available for both the iPhone and iPad as one universal binary download. If you need a multipurpose conversion utility with cloud storage support on your iPhone or iPad, SuperFiles is your app. SuperFiles has it’s uses and there will be people who will like it. AppSafari review of SuperFiles was written by Joseph Ho on August 26th, 2010 and categorized under App Store, Email, Files, Notes, Productivity, Utilities. Page viewed 4303 times, 1 so far today. Need help on using these apps? Please read the Help Page.